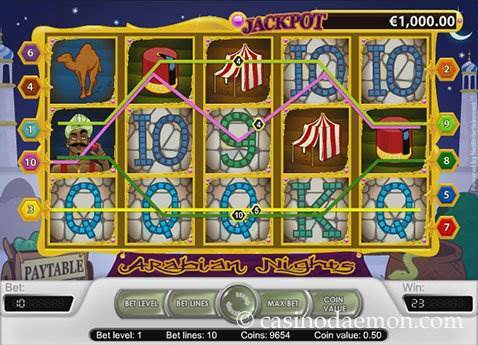 One of the largest progressive jackpot games is Arabian Nights from Netent. The progressive network jackpot is often worth hundreds of thousands, which makes it one of the biggest. However, I would like to say this at the beginning: playing this game is not cheap, and if you have a smaller budget, but still want to try your luck at a progressive jackpot, you should choose another game, such as Mega Fortune or Gladiator, as Arabian Nights has a relatively high minimum stake and a very high variance. The theme of the game is, as the name suggests, the stories of 1001 Nights. They are drawn in comic style, and show the magic lamp, the genie, a sword, shoes, a tent, a fez, a camel, but also the classic symbols K, Q, J, 10 and 9 for the lower paying combinations displayed in a charming mosaic style. The game is pretty straightforward and does not have many complicated rules to remember. There are special wild symbols, and you can win free spins with tripled winnings. The theoretical return to player depends on the type of jackpot. If the game is played without the progressive jackpot (lower than 10 pay-lines enabled), the payout is 90.6%, if the game has a local progressive jackpot, the payout is 95.2%, and if the game is offered with a progressive network jackpot, the payout is 95.6%. Most casinos offer the game with the pooled network jackpot, and we would not recommend playing the game without enabling all the paylines for the chance to win the progressive jackpot. There are much better games with a lower variance and a higher return to player. As this is a progressive jackpot game, you will notice that the variance is very high. This means that there will be many game rounds where you won't win any money, and you will mostly win smaller amounts. Most people play this game in order to get the chance to win the progressive jackpot, and even if you make it to the free spins, you might be disappointed, as you might not win a whole lot of money there. 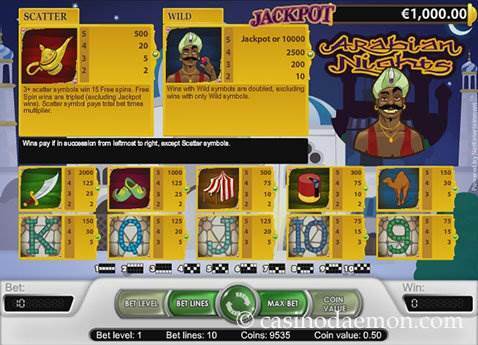 As the game is older, it is not possible to play Arabian Nights mobile, and you can only try your luck to win the jackpot at a desktop or laptop computer. Although you cannot win the progressive jackpot in the demo version of the game, you can try it out without any risk of losing money. Play Arabian Nights for free and see if you like the game. You can bet real money in the game in one of the casinos listed on this page. The game features a wild symbol, depicted by the genie, and he replaces all other symbols for winning combinations, except for the scatter symbol. Combinations formed with the wild symbol will also be multiplied by 2, except when the combination is made up of just wild symbols. The scatter symbol is the magic lamp, and when you get 3 or more of these symbols anywhere on the screen, you will get an instant win and start 15 free spins. All winnings you get in the free spins will be tripled. The chance to win the jackpot is probably the reason why most people play the game. 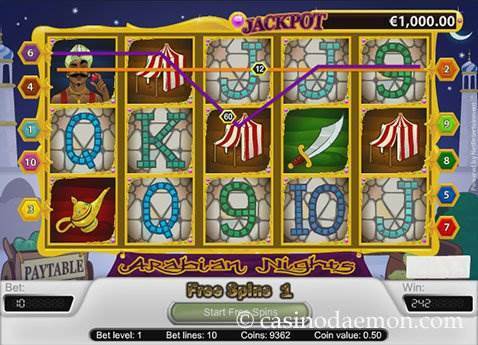 In order to win the jackpot you will need to enable all 10 pay-lines and get 5 symbols with the genie on one line. 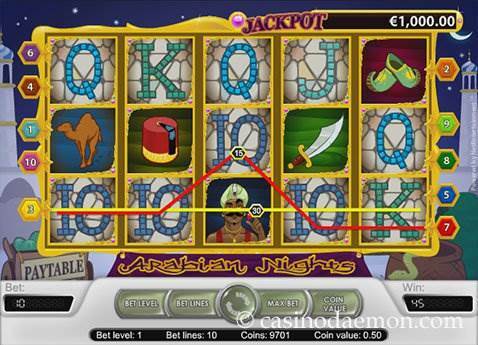 The online slot Arabian Nights has 5 reels and 10 pay-lines that can be selected individually, however it is advised to play all pay-lines for the chance to win the jackpot and the highest theoretical return to player. The game doesn't have many betting options, and you can only play with one coin value, which is 0.50 £/$/€ per line. You can select between 1 and 10 pay-lines, which means that the minimum stake is 0,50 £/$/€ and the maximum is 5 £/$/€.